The earliest morphologically distinct myeloid cell is a myeloblast. Cell with myeloid commitment at stages of differentiation between the pleuripotant stem cell and myeloblasts have been identified but these lack morphological characters of a myeloid lineage. Myeloid cells share a common precursors with the cells of the monocyte-macrophage system in the form of CFU-GM. CFU-GM matures into CFU-G, a precursor for myeloid cells and CFU-M, a precursor for cells of the monocyte-macrophage series. There are five morphological distinct stages of myeloid precursors, myeloblast, promyelocyte, myelocyte, metamyelocyte and the band form. Only the first three are capable of cell division. Myeloid cells in the peripheral blood are classified into neutrophils, eosinophils and basophils depending on the staining characteristics of the cytoplasmic granules. Morphological evidence of commitment one of the myeloid lines is seen at the myelocyte stage. Electron microscopically commitment can be seen at the promyelocyte stage. Very immature blasts lack morphological features of any lineage making it impossible to classify them as myeloblast, monoblast, lymphoblast or pronormoblast. Lineage identification in such cases may be aided by the company they keep, immunophenotyping and staining for peroxidase and esterases. Promyelocyte (Figure 2): Slightly larger than a myeloblast (15-25μ), the promyelocyte is the largest cell of the myeloid series. Its nucleus is slightly indented, has a fine chromatin (though coarser than the myeloblast) and has nucleoli. Later stages show a slight chromatin condensation along the nuclear membrane. The cytoplasm is basophilic with prominent primary azurophilic granules. Endoplasmic reticulum is prominent and takes the form of dilated vesicles. Cells have a perinuclear Golgi apparatus that manifests as a perinuclear halo, but only in normal cells. Tough it is not possible to differentiate the promyelocytes of the three granulocytic (neutrophilic, basophilic, eosinophilic) series on light microscopy, electron microscopic difference exist. Leukaemic promyelocytes may be of the hypergranular or the hypogranular variety. The hypergranular variety has numerous small granules and Auer rods. Patients usually present with pancytopenia. Apart from having few or no granules in the cytoplasm the hypogranular variety may have a bilobed or folded nucleus. Myelocytes (Figure 1,3, 4 and 5): Lineage specific granules appear in the myelocyte stage. The cell is slightly smaller (10-20μ) than the promyelocyte and has an eccentric nucleus, round to oval, flattened on one side. Nucleoli are small and are only seen on EM, chromatin is coarse. Primary (azurophilic) granules persist but as no new granules are synthesized their number decreases with each division. The ratio of primary to secondary granules in a mature neutrophil is 2-3:1. Primary granules contain myeloperoxidase. The granulation of the endoplasmic reticulum is lesser than promyelocyte and as myelocytes mature the cytoplasmic basophilia decreases and finally disappears. 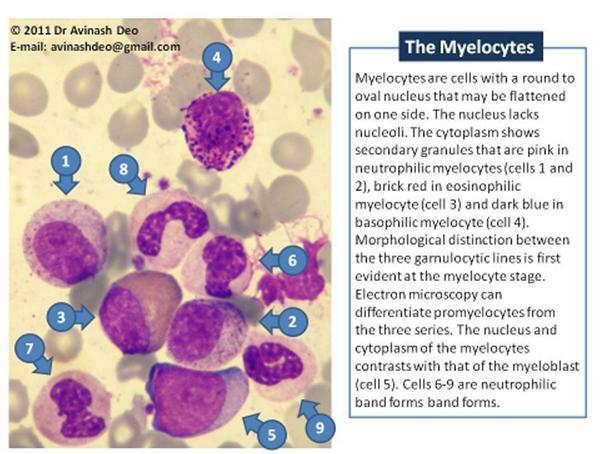 The myelocyte may be neutrophilic, eosinophilic or basophilic. The granules of neutrophilic myelocytes are lilac, eosinophilic myelocytes are orange-red and basophilic myelocytes are purple. The eosinophilic myelocyte may contain purple staining granules. These are structurally different from granules of basophilic myelocytes. Myelocytes are the last stage to have the capacity to divide. Table 1. Charecteristics of granulocyte granules. The colour of the letters is the same as that of the granules and the backgroung the colour of cytoplasm of the cell the granules are most prominant in. Metamyelocyte (figure 1): Myelocytes matures to a metamyelocyte with appearance of nuclear indentation. Metamyelocyte can not divide. Unlike the transformation of a promyelocyte to a myelocyte that is accompanied by distinct morphological changes (disappearance of nucleoli, appearance of secondary granules) the most pronounced change that takes place when a myelocyte transforms into a metamyelocyte is indentation of the nucleus. Time-lapse photography has shown that the myelocyte nucleus can developed pronounced indentation and then revert to an oval shape. The distinction between the two stages is physiological. Metamyelocytes can not synthesize DNA, myelocytes can. Fortunately the distinction between a myelocyte and metamyelocyte is of little clinical importance and the ability of the cell to synthesize DNA is only assayed for research. Myelocyte 10-20μ Round to oval, indented, chromatin more coarse than promyelocyte, no nucleoli Most immature forms have less basophilia than the promyeloblast. Basophilia disappeaqs as cell matures. Secondary granules appear. Metamyelocyte 12-18μ Indented, coarse clumped chromatin Pink with secondary granules. ur article is quite informative sir. i wanted to ask that one point which discriminates myelocyte from promyelocyte? is it the presence of nucleoli or prominent granules. if a myeloid cell (?myelocyte or promyelocyte) has prominent and coarser granules but no nucleoli then what it will be called? Promyelocytes and myelocytes are distinguished on light microscopy by the presence of secondary (neutrophilic, eosinophilic or basophilic) granules in the latter. Myeloid maturation is a continuous process of which appearance on light microscopy is just one of the perspectives. 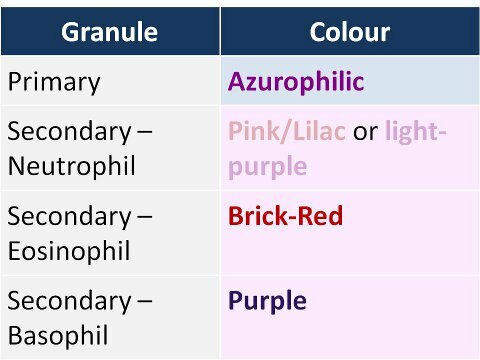 On light microscopy primary (azurophilic, the prominent granules you have written about) granules of promyelocytes of neutrophilic, eosinophilic and basophilic series are indistinguishable. On electron microscopy histochemistry and biochemistry the azurophilic granules of the three series appear different. The myelocyte nucleoli are small but rarely may be seen on light microscopy. They are visible on electron microscopy. The issue is not how you can differentiate the two cells by light microscopy but does this differentiation have any diagnostic utility. Acute myeloid leukemia is diagnosed when the marrow shows 20% or more blasts. Patients with recurrent genetic abnormalities are an exception to this rule. Acute leukemia can be diagnosed in these patients even if there are less than 20% blasts. All patients with acute promyelocytic leukemia have recurrent genetic anomalies [most have t(15;17)(q22;q12) few may have t(5;17)(q23;q12) or t (11;17)(q12;q12)] and the number of promyelocytes has no bearing on the diagnosis. If a patient appear to have an increase in promyelocytes chromosomal studies and FISH are mandatory for confirmation of acute promyelocytic leukemia. Morphology plays a limited role in such patients. Finally, if one has to make a differentiation on light microscopy, the peripheral smear examination may give a clue. Increased promyelocytes are associated with acute promyelocytic leukemia that typically presents with pancytopenia. Variant froms of acute promyelocytic leukemia can present with leucocytosis but the promyelocytes in these patients lack prominent granulation that can cause confusion with myelocytes. Myelocytes are increased in myeloproliferative diseases, typically in chronic myeloid leukemia. These patients present with leukocytosis with a spectrum of immature myeloid cells (blasts promyelocytes, myelocytes, metamyelocytes). But there’s 1 part I am facing difficulty today during my case study on a lab session, how do we differentiate an AML (Acute Myeloid Leukemia) and ALL (Acute Lymphoid Leukemia) based on a peripheral blood film with a light microscope? 2. Nucleus: The chromatin of myeloblasts is finer than lymphoblasts. The nucleus has more nucleoli (2-3 but may be up to 5). The nucleus of a lymphoblasts has fewer nucleoli. 3. Cytoplasm: Myeloblast cytoplasm is less blue than a lymphoblast. Lymphoblasts do not contain granules. The presence of Auer rods indicates the cell is a myeloblast. Do you know of any practice website for counting differentials? I have a hard time with myelocytes and promyelocytes. I want to ask sir, do you have an eosinophilic promyelocyte??? as far as I know no, and you mentioned this in your article. Please reply! Sorry fro the very delayed response. Commitment to a lineage at the promyelocyte stage can only be seen under an electron microscope. Under the light microscope the promyelocytes of the three granulocytic series are indistinguishable. Ur article s very much informative. Honestly I don’t have an answer. I would believe that the membrane is too thin for the stain to take. If the membrane was taking a stain then subcellular structures would not be seen clearly.